The term beloved may be an understatement when it comes to Stephen King’s It. The iconic image of Pennywise is a staple of the horror genre, mostly due to Tim Curry’s performance of the character in the 1990 TV movie version of King’s tome of a novel. 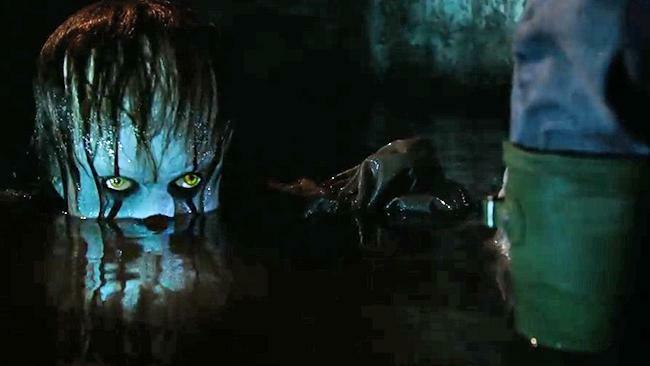 Andy Muschietti, director of the tepid Mama, returns to the horror genre with the 2017 adaptation of It. The film replaces Curry with Swedish actor Bill Skarsgard, whose delightful campy performance rivals Curry’s adequately. Without needless comparison—such a rabbit hole would siphon any light out of a critical interpretation—Muschietti’s It is a genre film that largely works through convention while trying to appear as an awe-inspiring novelty. This is to say that the film relies on dreamy, macabre imagery to make it feel fresh, while still falling back on orchestral stings to sell jump scares that are never truly startling in any way. The imbalance between the two sinks the film, watering down whatever tension could have existed. In terms of Pennywise and his creature incarnations are concerned, the scratchy score and the rapidity created from sped-up footage diffuses moments of tension by being silly and ineffective. The score of the film is truly grotesque. Set in 1988, the film tries to create a throwback atmosphere similar to Stranger Things with its casting and production design. While this all works really well, the score ruins this ’80s aesthetic with modern sonic conventions of the horror genre. The CGI use in the creature design, too, takes the audience out of the 1980s aesthetic at times. Most of the time the Pennywise design itself is good—save for when the aforementioned speed changing occurs—but other monster designs in the film do not come off as visually natural in the narrative world, even when these creatures are nightmarish visions. The redeeming factor of It is the children. These characters all are tasked with facing their personal fears, which are set up and developed well. And the actors portraying these kids do a marvelous job of creating a natural friend group. The fragmentation of the narrative around these characters is what lessens the film, particularly in the film’s second act. Set pieces involving each child being separately terrorized comprise pretty much the entire act, and most of the time these scenes are not particularly memorable or well-executed. What works better is the third act, when the children go together to the haunted house that Pennywise calls home. Here, the sequences come closest to bringing actual tension to the material. In particular, a scene involving the character whose fear (unfortunately for him) is clowns works very well. The imagery in It has potential to create a really chilling atmosphere. From the introduction of Pennywise with the paper boat to a trail of smoking Easter eggs, there are moments where Muschietti could have ratcheted up tension to an unsettling degree. Instead, It wallows in horror convention in a way that ruins these potentially great moments. With the narrative fractured as a result of a need for these horror set pieces, it is hard to really find a heart in the film beyond the chemistry between the children, the performance of Skarsgard, and the capturing of the nightmare imagery by Handmaiden and Oldboy cinematographer Chung-hoon Chung. It has an intense mainstream appeal, in that it is adherent enough to convention while still providing visual symbols that feel new. But don’t be fooled, as the film fails to provide anything truly memorable or unsettling. As the film progresses, it feels as though it may be indulging in camp for the self-aware audience, but all It really wants to be is another in a line of successful popcorn horror flicks.